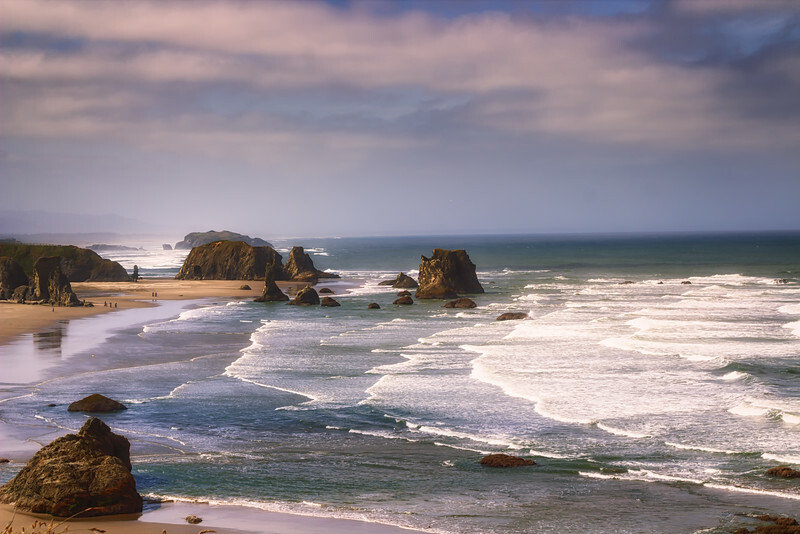 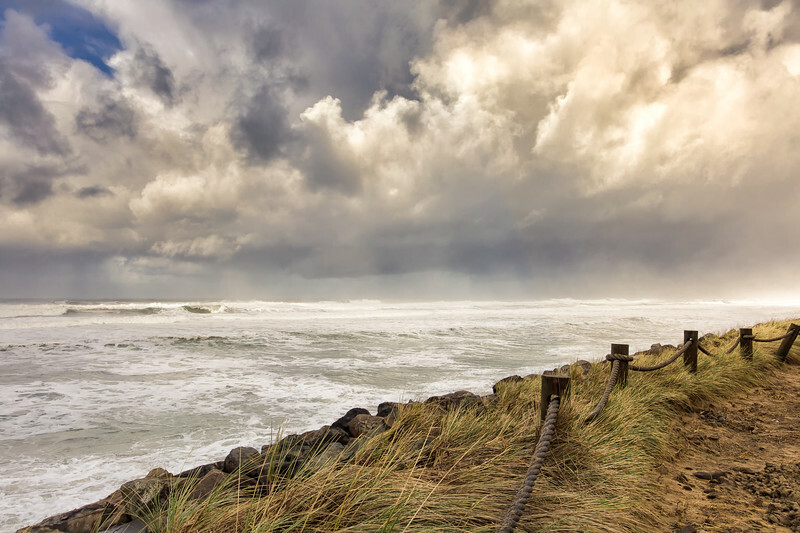 A stormy day In Rockaway Beach on the Oregon Coast when a sun break glowed through the clouds, illuminating the seascape. 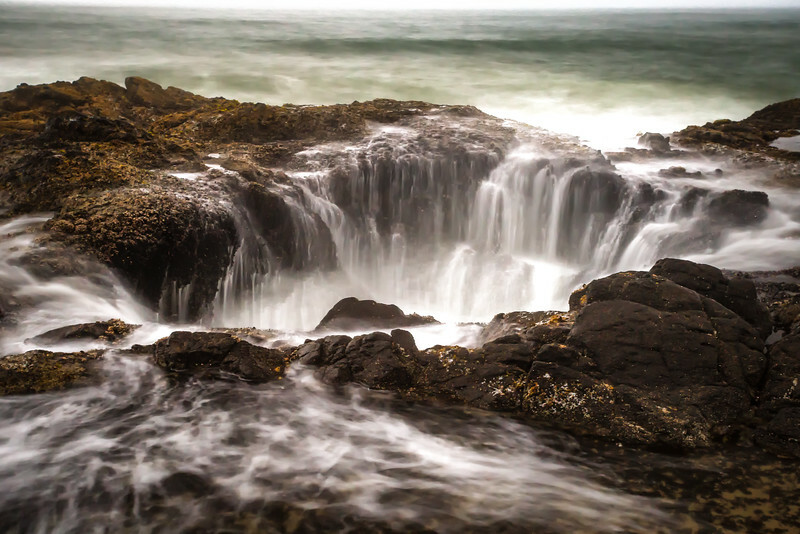 The day was overcast and drizzly but I held out hope for a break and the miracle happened. 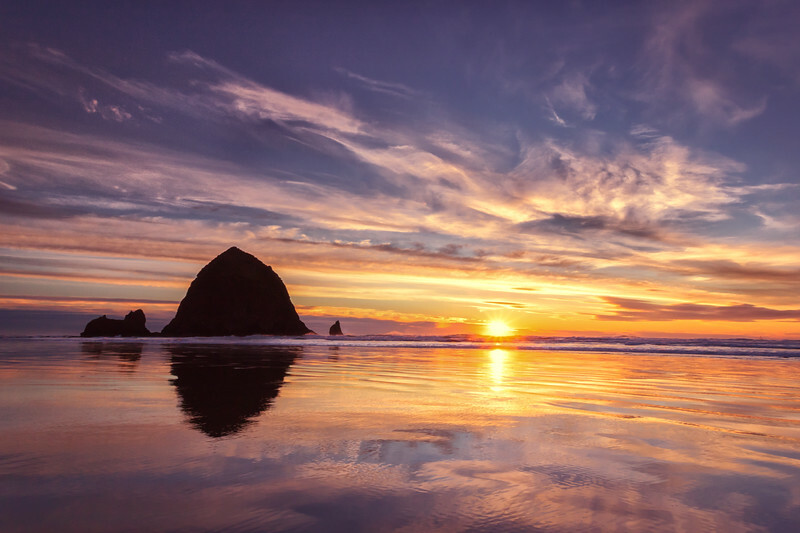 The overcast skies lifted just in time for this magnificent sunset of many colors over Haystack Rock in Cannon Beach, Oregon. 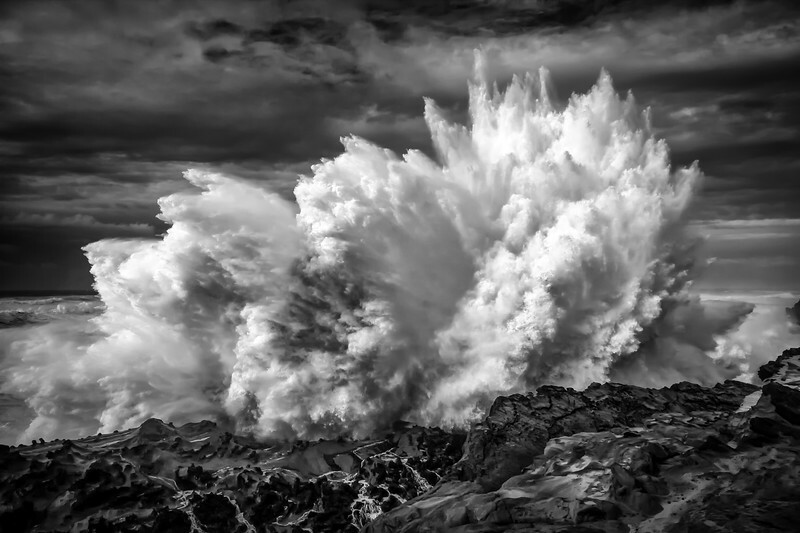 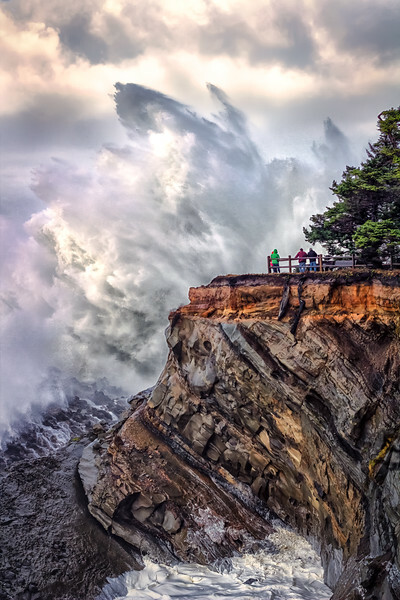 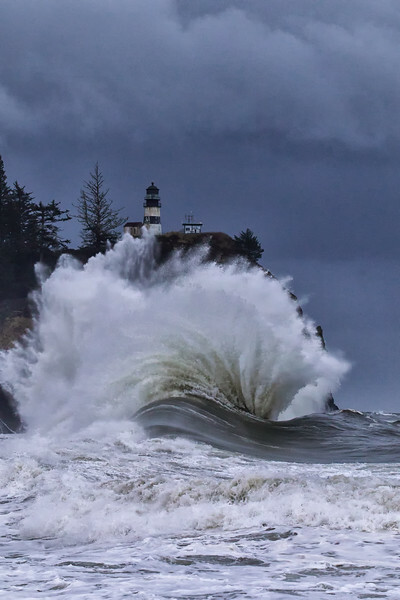 A gigantic wave looks surreal as it hits the rocks, while onlookers marvel at the sight of Mother Nature's power. 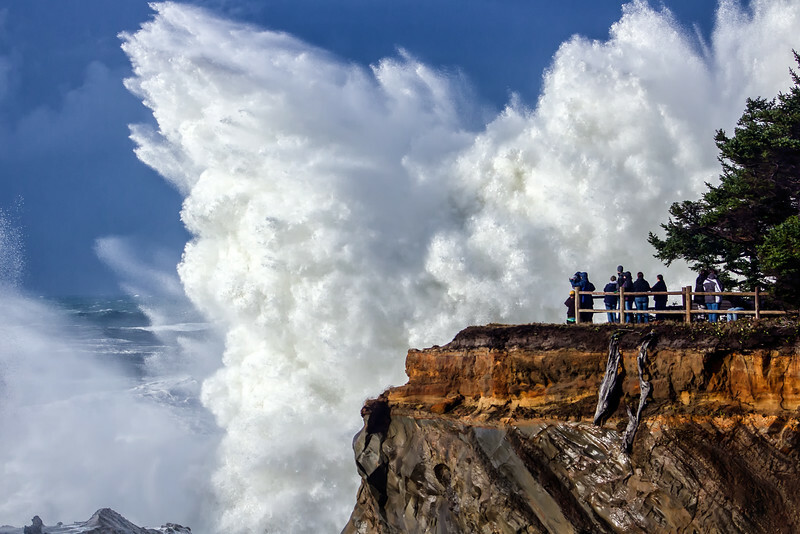 Onlookers watching in amazement at the HUGE waves exploding high into the air at Shore Acres State Park in Coos Bay Oregon during a winter storm. 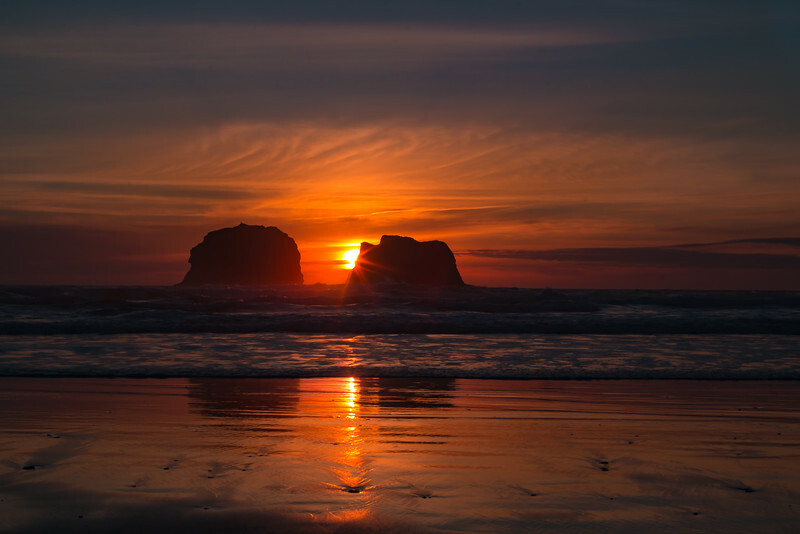 Every single sunset on the Oregon coast is different. 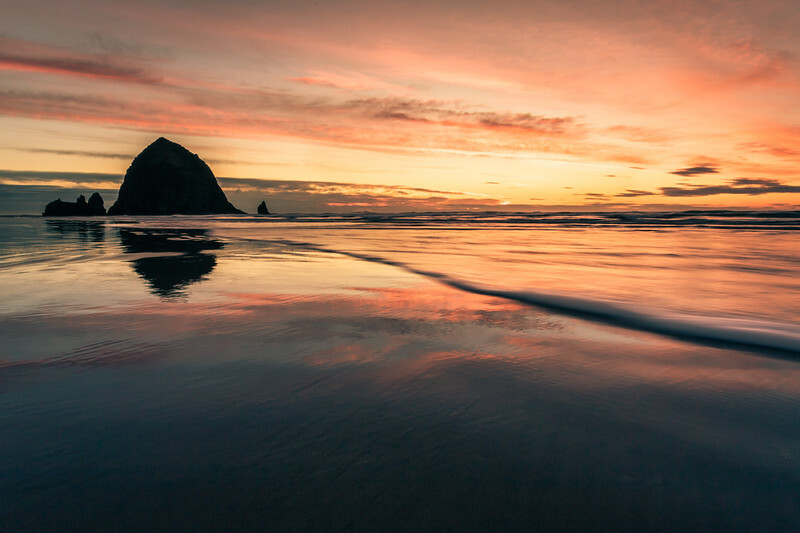 This one showed a beautiful salmon and pink sky over Haystack rock in Cannon Beach. 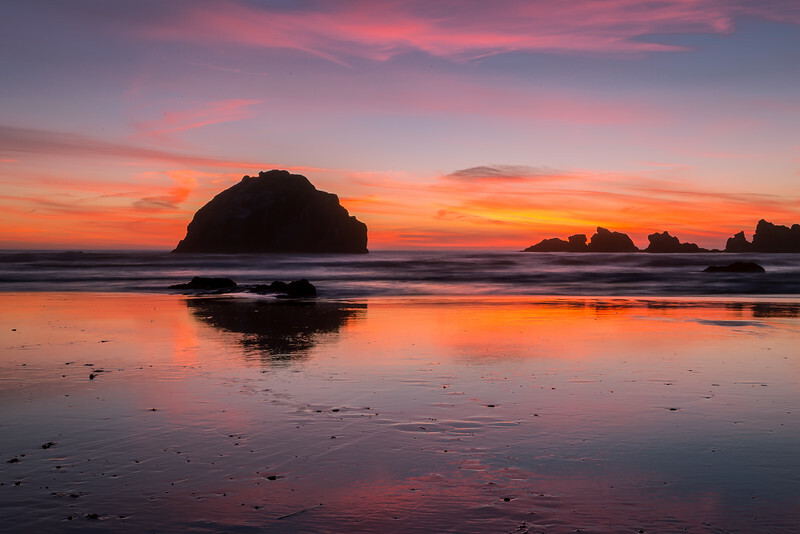 She lies serene in the Bandon Oregon, setting sun. 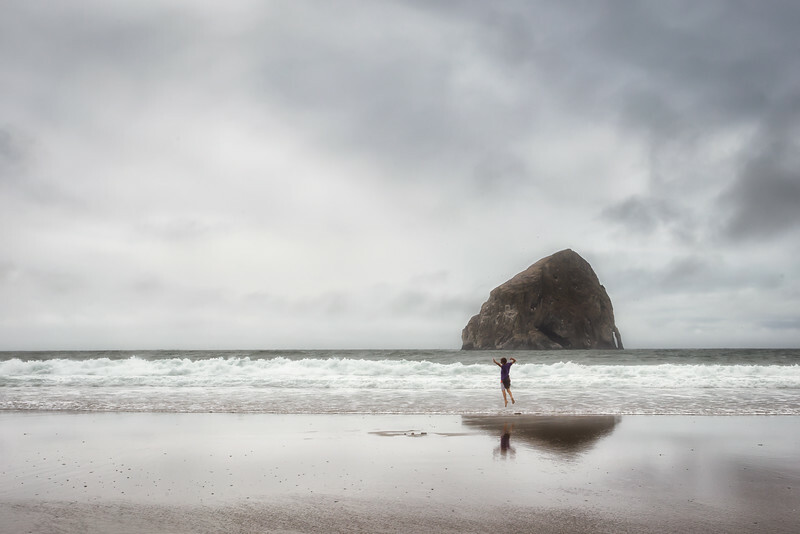 As I walked the beach in Pacific City, I couldn't help but stop and capture a photo of this boy, all alone in the surf, jumping for joy! 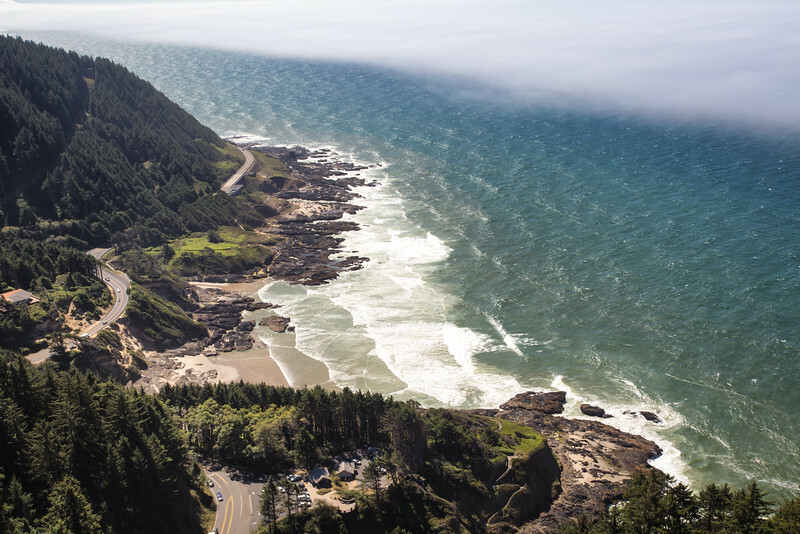 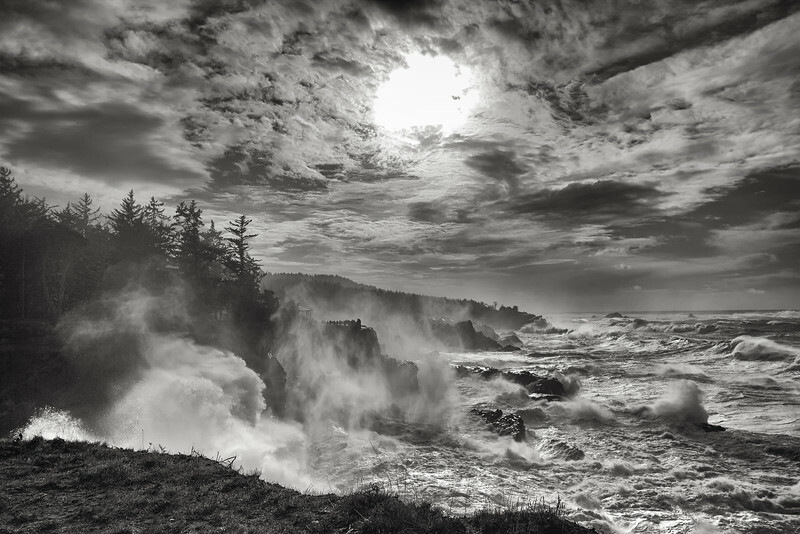 Distant rain on the horizon at Boiler Bay on the central Oregon coast. 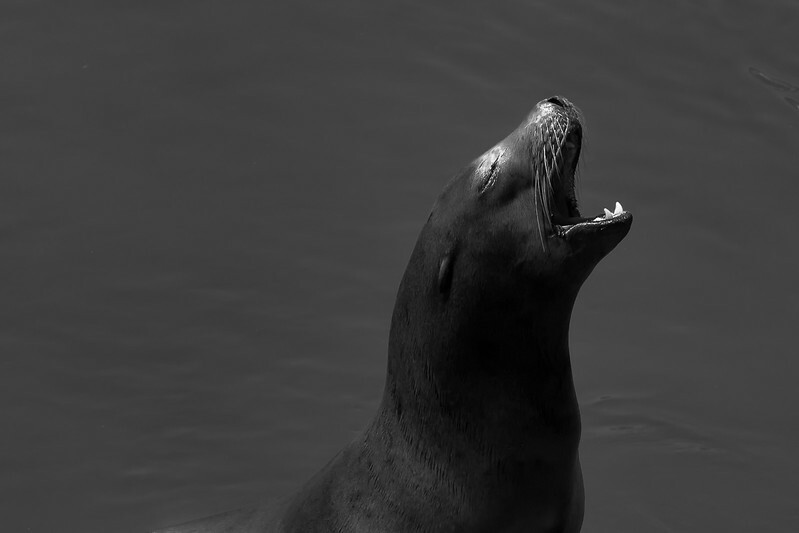 A sea lion on the docks in Newport Oregon barking and basking in the warm sunshine. 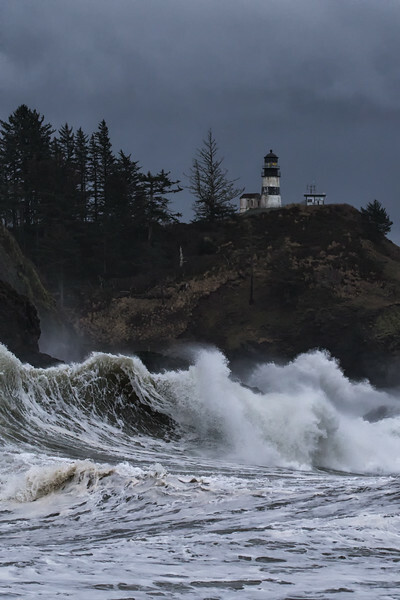 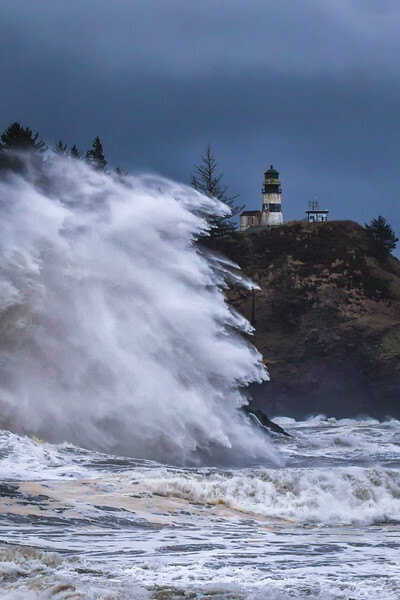 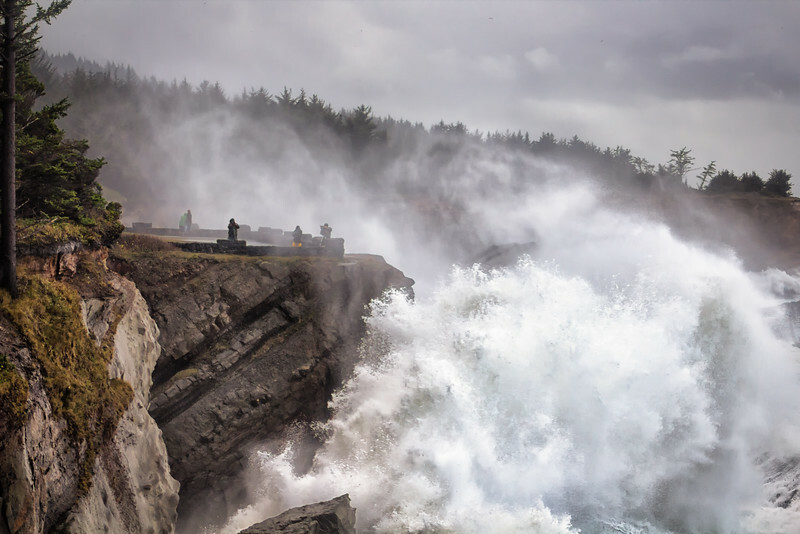 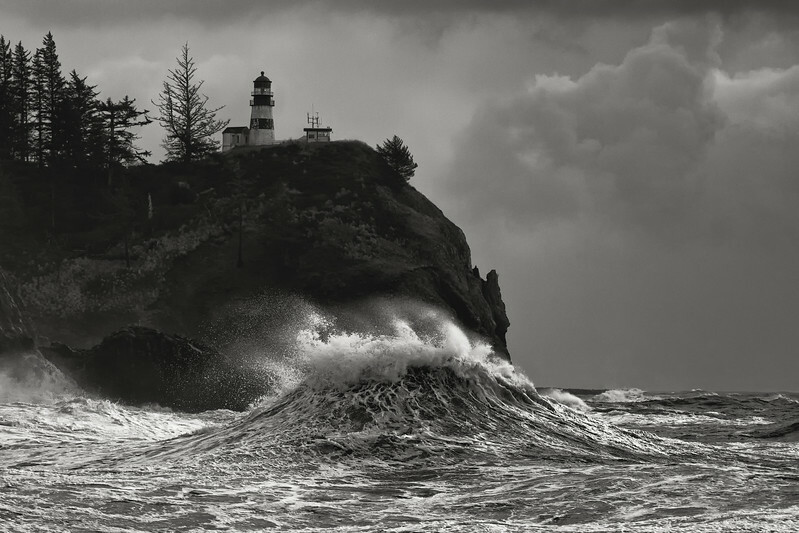 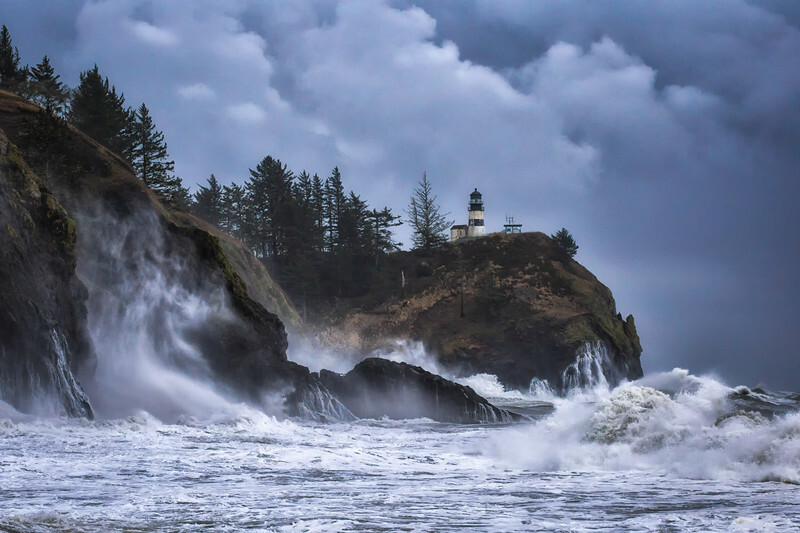 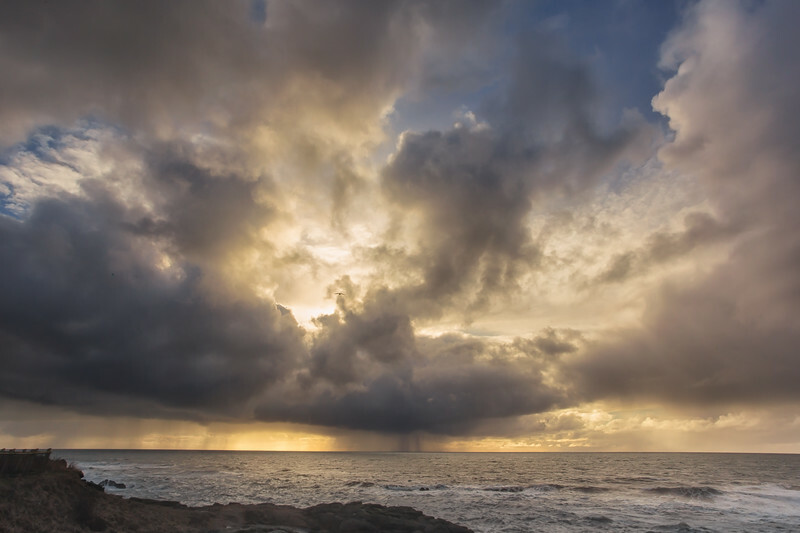 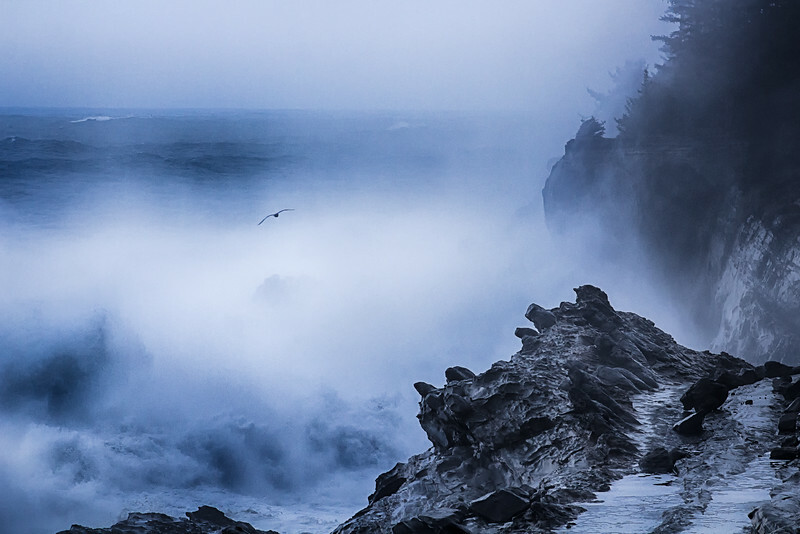 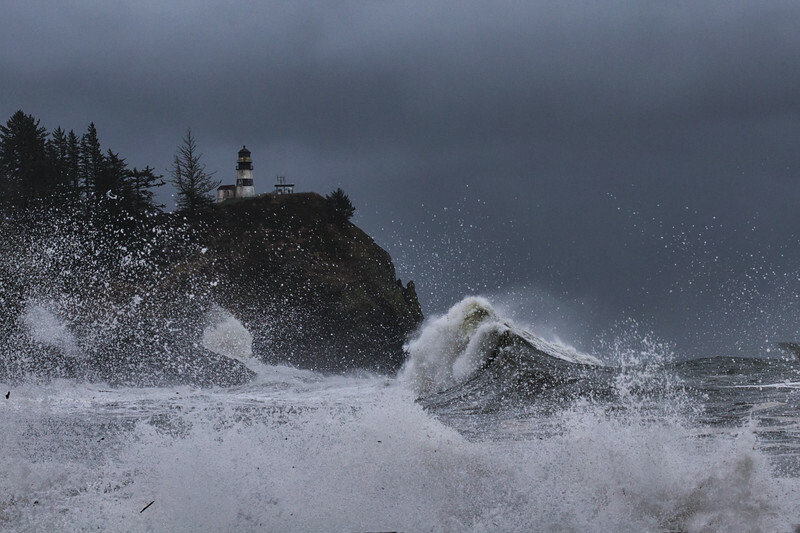 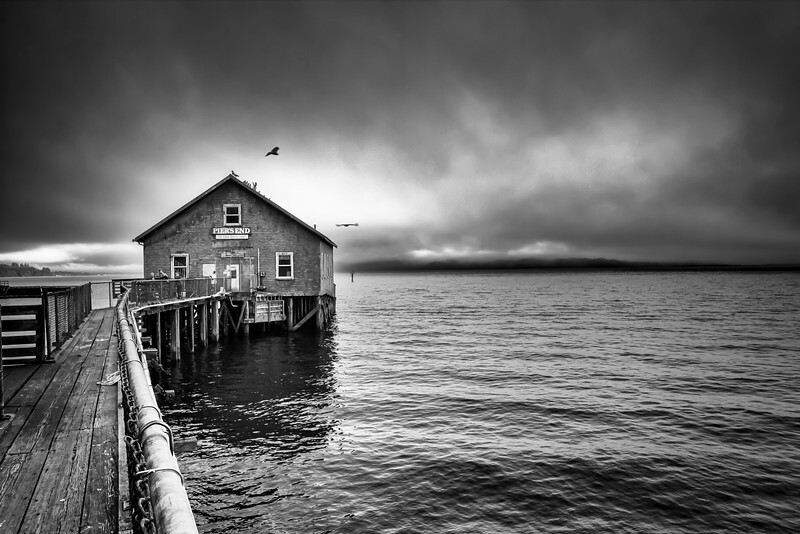 The wild unpredictable weather on the Oregon coast in Depoe Bay. 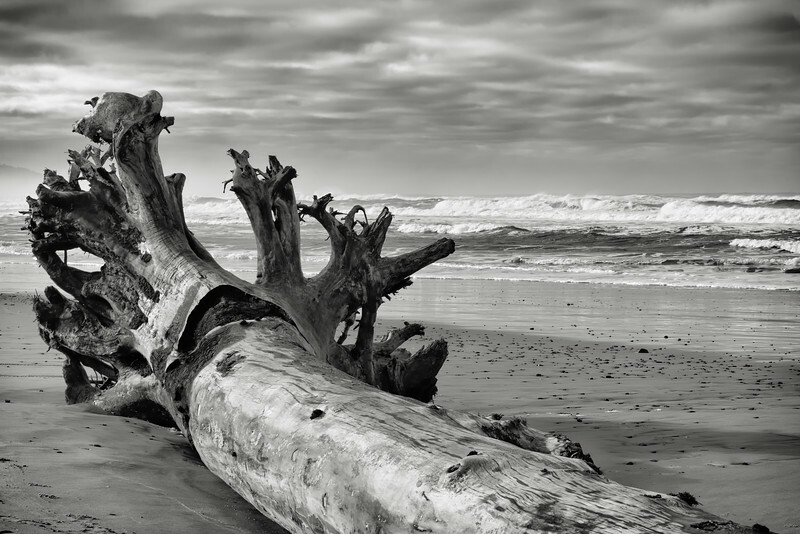 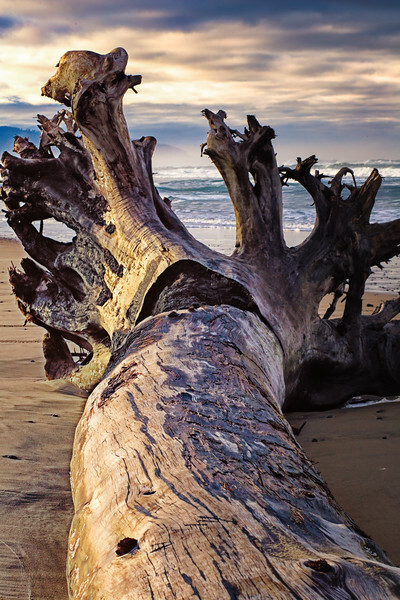 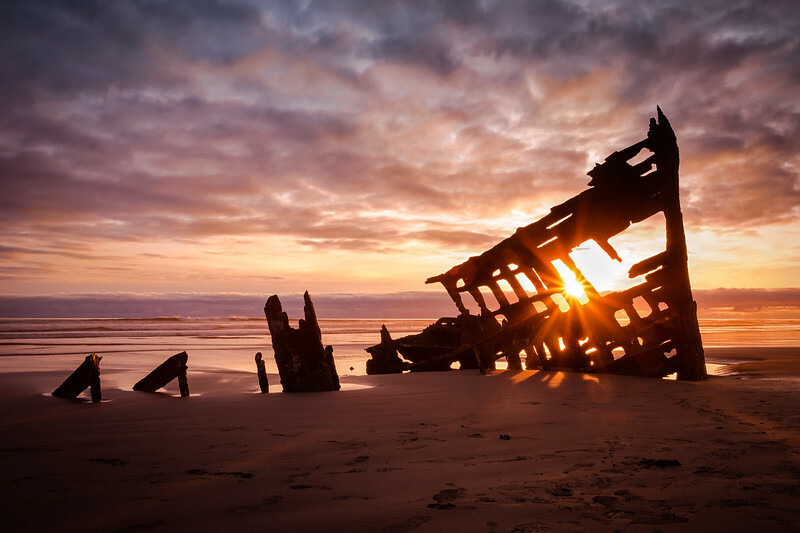 The remains of the 1906 shipwreck in the setting sun at Fort Stevens State Park in Warrenton on the Oregon Coast. 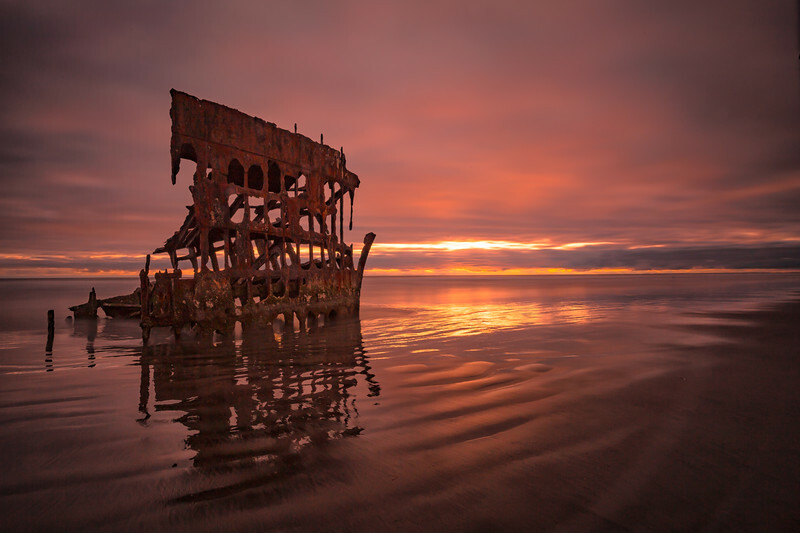 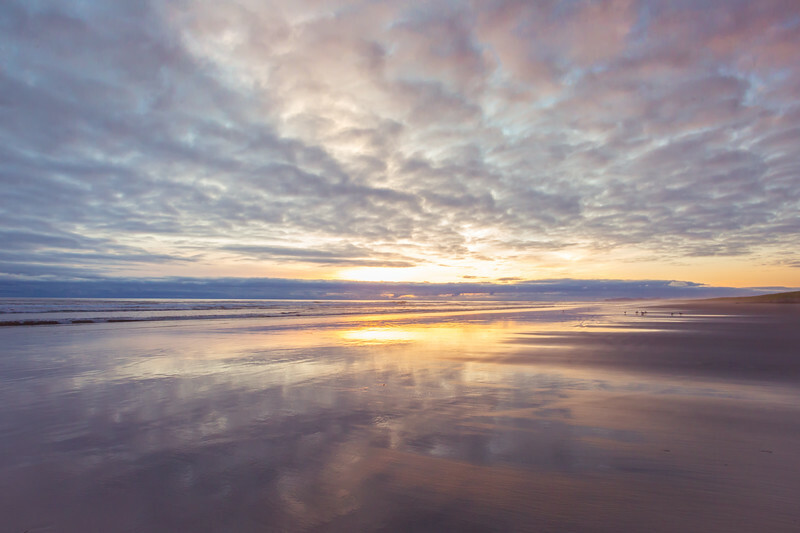 The remains of the Peter Iredale at sunset at Fort Stevens State Park in Warranton on the Oregon Coast. 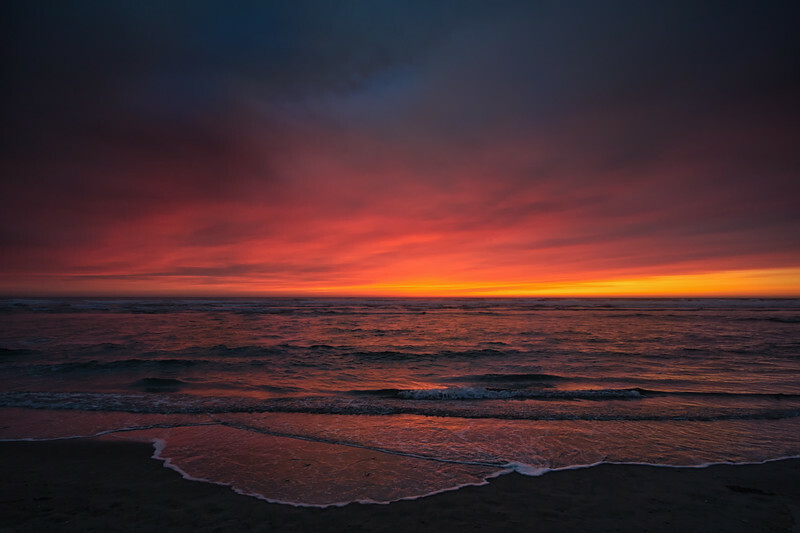 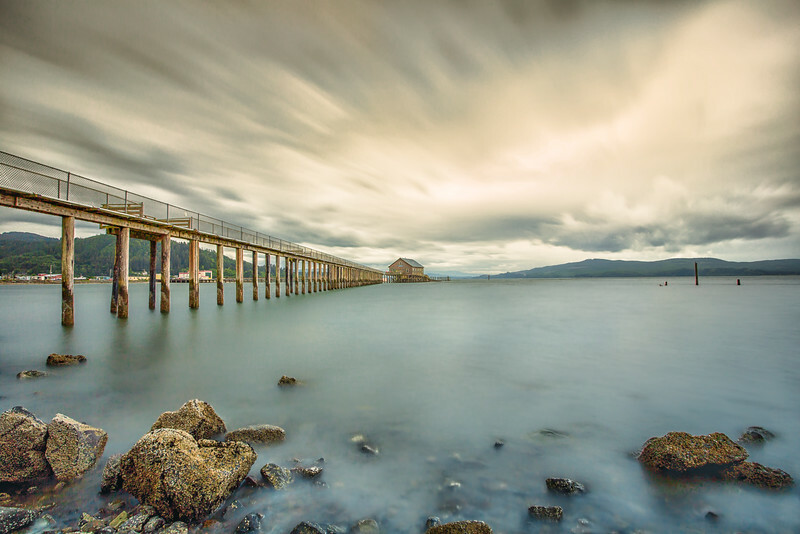 A long exposure image of the peaceful sea after the sunset, looked like a watercolor painting. 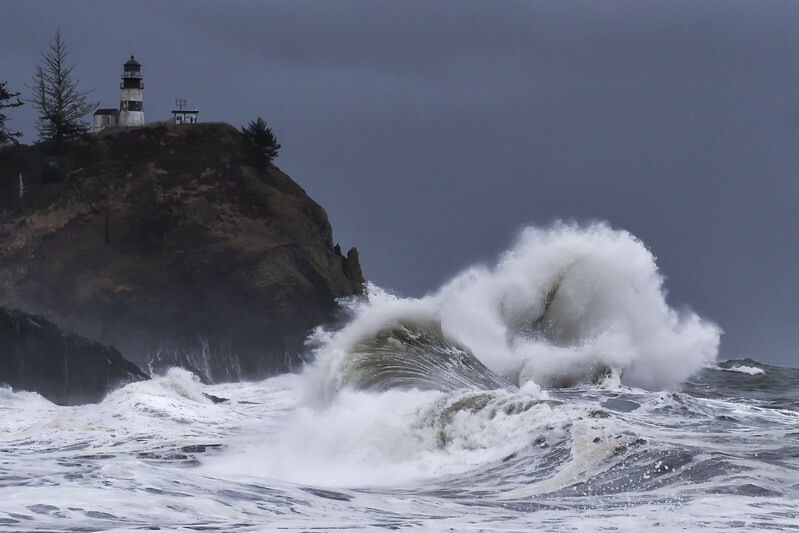 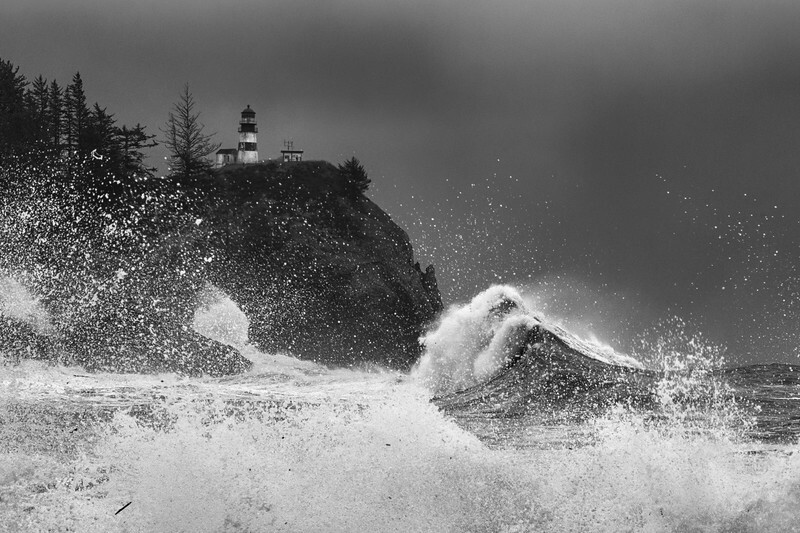 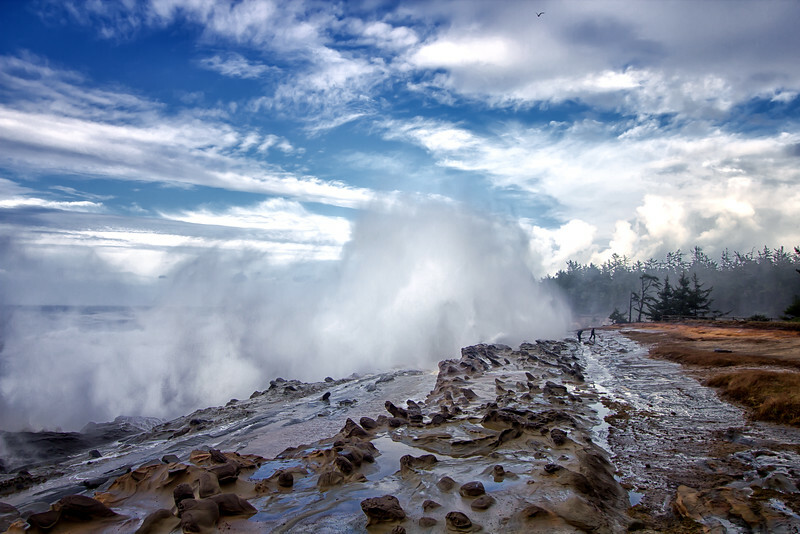 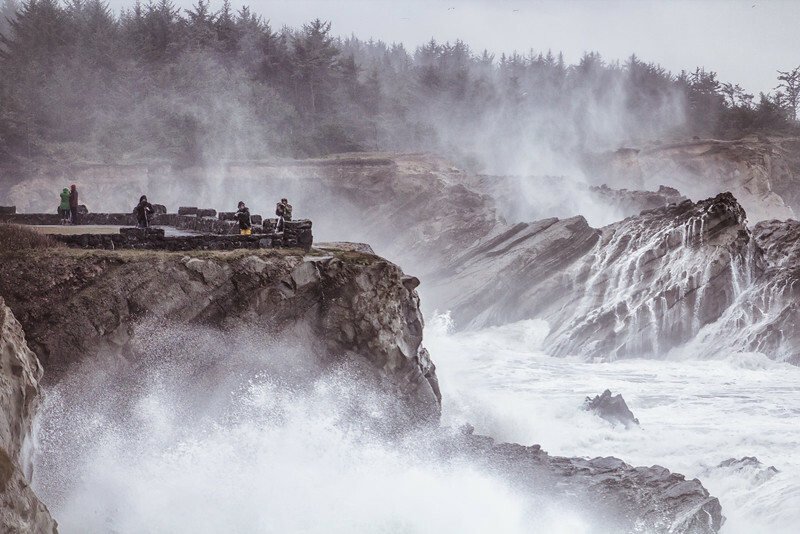 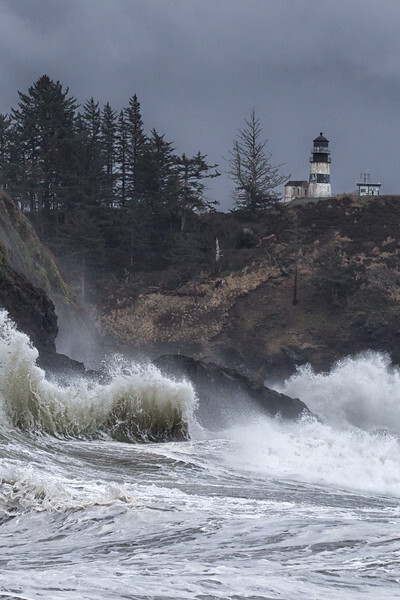 Wave exploded on the basalt reef at Shore Acres in Coos Bay during a storm. 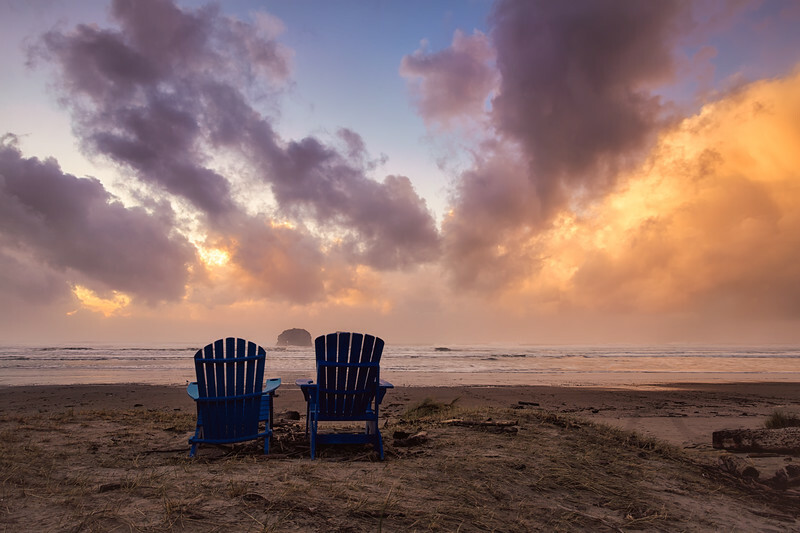 All the recent wildfires in Oregon create vivid skies even after the sun has slipped below the horizon in Rockaway beach on the Oregon coast.